Call me strange, but Kim Ki-Duk's THE ISLE is one of my favourite Korean movies. Not just the beautiful imagery, not just those scenes that had people fainting in the theatres, but because I empathised a lot with the characters, and the symbolism of their environment and their actions was very much in tune with my sensibilities. OK, so I'm strange . Much as I enjoyed watching it, I won't try and argue that watching THE ISLE is a 'pleasant' experience - not one to leave you with a smile, so I was prepared for something a little bit serious and grim with ADDRESS UNKNOWN. It is not a little bit serious and grim at all... it is *completely* serious and amazingly grim. Kim Ki-Duk is less interested in exploring the somewhat global issues of human feelings here, but instead wants to explore the feelings of a nation - Korea, still living in the shadow of the Korean war. The characters here come across as a little apersonal (it's ok, I just invented it) because they are embodiments of the country's experience... the division, the loss of autonomy, the dehumanisation that people feel, caught up in the conflicts between North and South and between Capitalism and Communism. Obviously to suggest that this was a universal Korean experience would be unreasonable, though Kim Ki-Duk is not interested in exploring balancing factors in this particular movie. People suffer. And suffer. And suffer. And then they suffer for a while. He is relentless in his examination of the pain that he clearly feels, for himself and for his country. It must be said that I know almost nothing about Korean history (though I am learning a lot as I type! 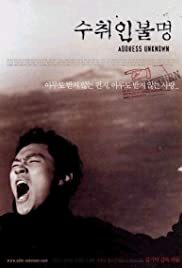 ), or of contemporary Korean society, so I don't know how common the feelings that Kim Ki Duk expresses here are, or how realistic his assessment of Korea's post war condition is. It all feels very believable, very convincing... but certainly none of the Korean people I have met are quite as utterly miserable as they must be if ADDRESS UNKNOWN were an accurate depiction of their lives. I think there is no doubt that for at least some people, and some communities, the feelings that Kim Ki Duk brings to the fore in the movie represent real feelings and real situations. But I think that it must be assumed that it is not an even-handed assessment of the situation, that he was quite certain what he wanted to say and permitted no deviation from it. In a way this is the movie's undoing... it is so relentless in its pursuit that it becomes too easy to get detached from it, to treat it as political allegory rather than a tale of human hardship. A little more warmth, a little bit of humour, maybe just one or two moments where at least one character was *slightly* happy... and I would have been much more able to bond with them, and their tragedies and miseries would have been that much more poignant as a result. A fairly small matter, and to a degree this observation may simply be an observation that I am not Korean. The movie is a very personal look at the feelings and circumstances of a nation, and having had no comparable experience myself, it is obvious that I'm going to struggle to fully relate. If I couldn't empathise with the characters though, I could at least sympathise with them. The characters themselves were good characters, and the performances were mostly very good. Notable exceptions are the American soldiers in the movie, whose English dialogue and delivery is really quite embarrassingly bad The movie is very light on dialogue - little that is important is expressed through words, because it doesn't need to be. Always a good thing in a movie. It is the younger characters of the movie that are centre stage, those who were born years after the Korean war ended, but are still suffering its consequences. It's always refreshing to see young actors deliver mature performances, and this is one such example. THE ISLE probably impacted me mostly because of the visuals - the beautifully photographed and haunting environment in which the movie took place. ADDRESS UNKNOWN is not nearly as pretty, which can partly be based on location, but also the fact that the style is a lot more realistic, gritty even, as opposed to THE ISLE's abstractness. It is still well filmed though. "if you want to take away the beauty of his film, you have to be willing to pay the price of the horror"
ADDRESS UNKNOWN is a less successful movie for me because once you get past it's horror, instead of beauty you find there's just a bit more horror . OK, it's not as bad as that... but the tone is quite unremittingly bleak. I don't know whether to recommend the movie or not. I liked it, but I'm not sure how many others will. Definitely not a movie to put on to take your mind off a troublesome day anyway! 35 of 40 people found this review helpful. Was this review helpful to you?